Launchpad couldn't import bug #596923 from GNOME Bug Tracker. Please take a look at the list of duplicate bugs. Please think on how many people get notified when you add anything to this bug report. Please don't confirm the bug it is already confirmed. Please don't attach further screenshots - we all know how the problem looks. We all appreciate your involvement, but read previous post carefully prior you post your own. We need to draw constructive conclusions and find the solution. Run 'killall gnome-panel' from the terminal or Gnome's "Run" dialog. The panels will automatically respawn correctly. When you get your icons distorted right-click on the affected panel (not icons) click "Properties". 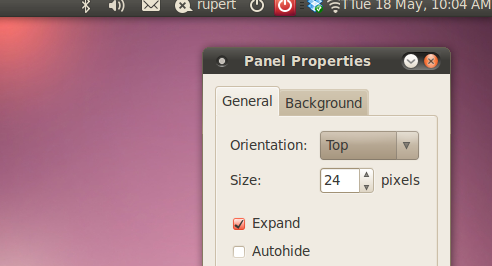 In "Panel Properties" change panel orientation to "Left" or "Right" and back to "Top" or "Bottom". In my case all icons are displayed properly, but one (nm-applet) is missing. Right click the Gnome panel and remove the offending applets and re-add them, i.e. Indicator Applet, etc. 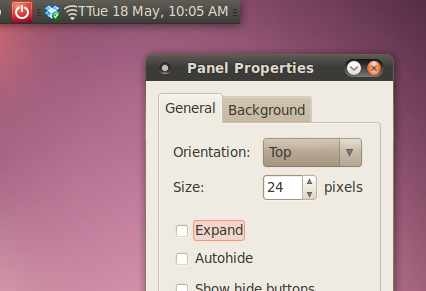 Right click the Gnome panel, click on Properties, Check Add Hide Buttons. and Close. Enough for now. If the error "runs" to lower panel, repeat the steps. I've opened the bug on GNOME's bugzilla, and it's linked here. Related to https://bugzilla.gnome.org/show_bug.cgi?id=588059 , perhaps? From what they described in the bug report, it seems like different bug, their icons wheren't drawn, but where functional. In my case the icons are drawn, albeit wrong ones, yet they aren't functional at all. Well, this bug haven't happened to me for the last 4-5 days, so I've marked the status of it in the gnome's bugzilla as invalid. Should I change the status in launchpad also, or should it be left as triaged? I am still seeing this bug with the RC. In my case the bluetooth icon doubles and the network manager icon is missing. Starting a guest session and coming back from it the phantom icon completely disappears only leaving empty space in the system tray. I am still seeing this bug with RC and updated packages. After login, the notification area shows wrong icons. 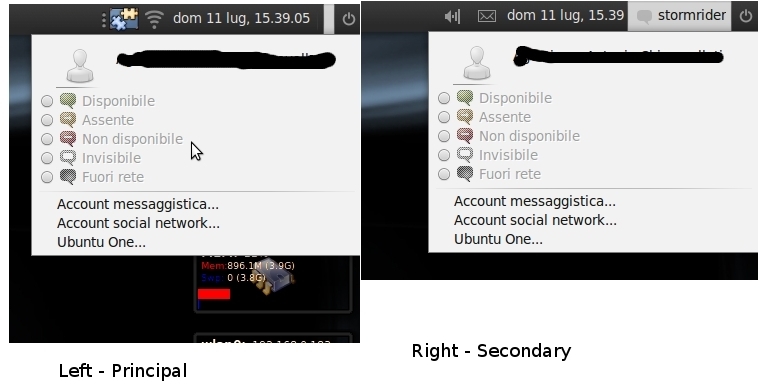 In the attached screenshot (after-login.png), for instance, the power management icon is displayed twice while the NetworkManager icon is not shown at all. Removing the notification area from the panel and re-adding it works around the issue, as can be seen in the attached screenshot (after-na-restart.png). The bug report is no longer valid for me. 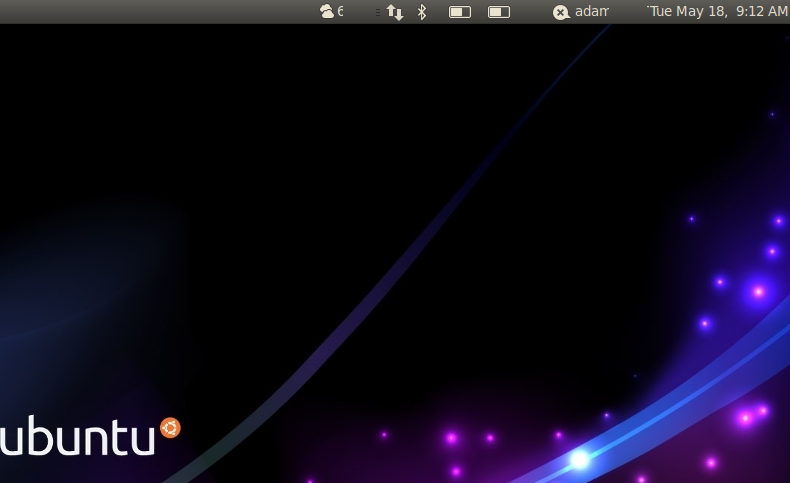 I'm running Ubuntu Studio 9.10 upgraded from 9.04 with Update Manager. Same for me on latest 9.10 amd64 (fresh install). 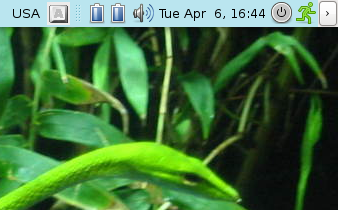 Seeing doubled sound-icon (see attached screenshot) and missing the network-manager applet. After killing gnome-panel (restarts automatically) everything is displayed correctly again. This bug doesnt appear on every login. like this:" 'In my notification area there's an empty spot at the far right without an icon, I have tried moving the notification area, but the empty spot stays there, preventing further movement to the right. Right clicking there and saying "Remove from panel" removes the entire notification area. I have removed and added it at an attempt to "restart" the area' "
Removing and adding again the notification area solves the problem until next reboot. I am not sure of this, but I believe this might be an Nvidia driver issue. I first saw this happen when using ARCH when they had updated to the 185 series drivers and saw it continue in the 190 series drivers. One can work around the problem if after start up( or login to gnome) one switches to VT1 ( by ctrl-alt-F1 ) and then switches back to VT7 (by ctrl-alt-F7 ). I think that this works because one is forcing a re-draw of the panel. My wild guess is that on start up, the icons are drawn on the notification area one at a time. When another icon is added to the notification area, it might not fit, so the notification areal is re-sized and the already drawn icons are moved over by a bit block transfer to either the left(or right). Sometimes the area that a moved icon previously occupied is not then erased with the background. Again, this is just pure speculation. ed Graphics Controller". How can I check what driver I use? The problem solved for me today, upgraded my GFX card (old nvidia with usage of nvidia driver version 173). The new card supports the latest drivers by ubuntu (version 185) and since this update the problem has gone. So in my case, it is/was nvidia driver related. I have Intel Corporation Mobile 945GM/GMS/GME and this problem still appear, but "phantom" icon is Bluetooth notification. The truth is that the problematic doubled icon varies. I think that since my last comment I've noticed the erratic behavior in every icon. I have the same problem with empty space instead of Network Manager applet icon. But it appears only when I'm resuiming from suspend/hibernate mode. 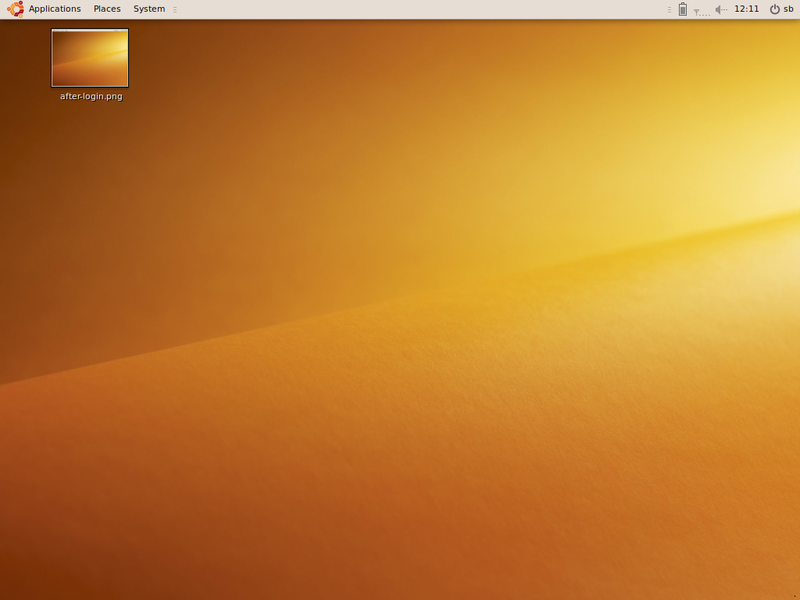 Ubuntu 9.10 x64 clean install, NVidia GeForce 9300M video with 185.18.36 drivers. Any additional info I can provide? I encounter this problem after I started using Compiz. One icon is missing (mostly the network icon) another has a fake (i.e. not functioning) copy - mostly the bluetooth or sound icon. 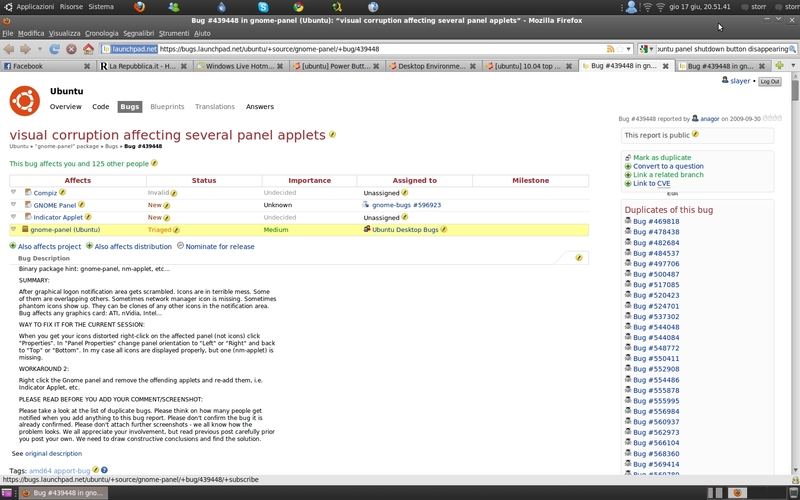 Rather annoying, so I made a workaround: a little script that kills gnome-panel - which is then automatically restart. This script is executed at start-up via 'start-up applications'. When Ubuntu is started, this script is unnoticeable executed and when the notification first appears it is already 'repaired'. The problem happens on my Nvidia 185 desktop as well. Solution proposed by Kees van Mill (#23) works in my case too. by default, or when I've customized my panels. It's a bug, someone fix it please. Same problem here. Using Dell Vostro A90 (Dell Mini 9 equivalent). Started after I've accidentally removed the notification area and later added it back. Ever since then, this problem has persist regardless of whatever approaches I have tried (found using Google search). Someone above suggested switching VT using Ctrl+Alt+F1 and then back again to Ctrl+Alt+F7. I had this bug where I had two volume control icons and no network manager. I did the above switch and switch back, and now I am seeing just a single volume control icon, and an empty space where the network manager should be. Therefore, in my experience, switching and switching back fixes the "phantom icon" issue, but doesn't fix the main problem which is that some icons are physically missing, and can't be clicked on. Also I get this bug fairly sporadically, but it's always exactly one icon missing and one icon duplicated. Usually I'm missing the network manager and the volume control is duplicated. Same problem with a computer upgraded from 9.04 using NVIDIA driver, and the same problem in another computer using a new installation and with a Intel card graphics integrated. I'm having the same problem. But I only noticed it for the last few upstarts, did never experience it frequently a month ago. I updated a few packages a couple of days ago, after which I started to notice this issue. Restarting gnome-panel is a working workaround for me too. I think this may be in some way related to compiz. I had the same exact thing happen to me - sound icon was being duplicated in place of the networkmanager icon. I'm using the nvidia 173 driver as the 185 package failed to work for me. I thought removing the icon then replacing it might do the trick, but when I removed the icon, gnome-panel got caught it some loop and just kept restarting itself every second over and over. Restarting GDM/X/GNOME did not help. I then removed compiz and not only did the loop problem go away, but so did the duplicate icon issue. I'm not 100% sure of the correlation as I don't know where the gnome-panel logs are stored to even check what the error was, but adding it just in case the compiz guys might have an idea of what is going on. I am noticing the same problem on i368 Karmic. Restarting gnome-panel works for me as well. This has only recently been happening, although, I'm not sure when it started. I installed over rather than upgrade, so the .files shouldn't have any hang overs from 9.04. The same here - the sound volume icon is duplicated and shown instead of nm-applet icon. killall gnome-applet or killall nm-applet; nm-applet fix it so I can start using wireless. I have 9.10 Ubuntu - installed from scratch so I do not think I have problems with conf files. i have something very similar to this. Using ubuntu 9.10 x64 i get duplicate icons. When I right-click a bluetooth icon and select "remove from panel" to try to get rid of the duplicate icon, I get very strange behavior. Both the upper and lower panels go on the fritz. They get stuck in a loop where they appear as they do when the PC first starts up. Then they disappear 3 seconds later. And the cycle repeats indefinitely. Logging in with "gnome-failsafe" stops the issue and renaming the .gconf lets me log in without using "gnome-failsafe" but it resets all the settings. Same here. My card is intel gma. I saw the problem (and reported) in linux mint too. I only see this bug in the 9.10 generation. Sometimes the icon is an empty space, but usually, replaced by a distorted version of another one. But in my case it's not just the notification area, but once it was the "computer temperature monitor" too, as you can see in my scereenshot. However, mainly it's the network icon. My system is an i386 karmic and I use compiz too. This annoying bug affects me also since the release of Karmic. After startup, in 80% times the Notification area is messed up, icons are duplicated and sometimes the sound is muted. NVidia FX5200 video card here, if it has anything to do with it. I never had this issue on previous Ubuntu releases. 'killall gnome-panel' does fix it for the current session, but the bug persists after every new startup. Bug confirmed here too, it happens every once in a while, when i do: "alt+f2 gnome-panel --replace" it always comes back the right way. Ditto here also...been experiencing the bug for as long as I have been using karmic hope it get fixed in lucid. Same with Lucid. Mostly showing double icons for bluetooth and sound. Actually u don't need to restart networking or anything else, just remove the notification area from the panel and add it again and you're done. problem has something to do with the indicator-applet-session panel applet. menu. It's a bonus that it removes some cruft from the panel area. If I delete the indicator-me happens the same! > problem has something to do with the indicator-applet-session panel applet. > menu. It's a bonus that it removes some cruft from the panel area. > of a duplicate bug (598065). > many people get notified when you add anything to this bug report. 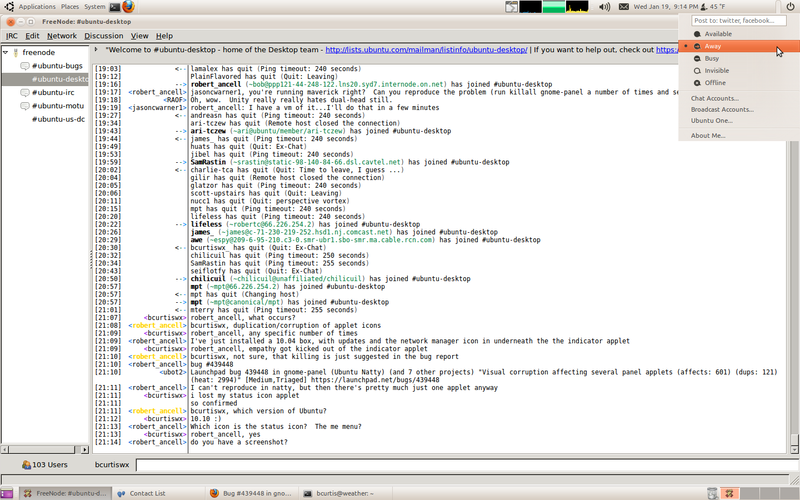 > Run 'killall gnome-panel' from the terminal or Gnome's "Run" dialog. > The panels will automatically respawn correctly. > case all icons are displayed properly, but one (nm-applet) is missing. > add them, i.e. Indicator Applet, etc. The clock applet was missing from the upper right panel and the other applets were moved around a bit. Sorry for the 4x duplicates, launchpad was timing out. I'm definitely not spamming. This is a bug I discovered and reported loooong ago. > > of a duplicate bug (598065). > > many people get notified when you add anything to this bug report. > > Run 'killall gnome-panel' from the terminal or Gnome's "Run" dialog. > > The panels will automatically respawn correctly. Joaquin was referring to Heather R Bealer, who wrote a link to an untrusted web-page by WOT (Web of Trust) Firefox add-on. > untrusted web-page by WOT (Web of Trust) Firefox add-on. > of a duplicate bug (586193). Hay algun modo de quitar la susceipcion al bug? >> untrusted web-page by WOT (Web of Trust) Firefox add-on. >> of a duplicate bug (586193). If you have any questions please have a look at the "Answers" section. Note that in Launchpad it is the only place where you can post in a different language than English; since any user has the right of understanding what it is said if it could be of his or her interest, like in bugs. I did a clean updated Maverick install a week ago, and I still have this bug. It has not been resolved. When I get properties on the Gnome panel and check-mark "Show Hide Buttons," the icon video defects go away for me. Temporarily? Or does this fix the problem for good? > Buttons," the icon video defects go away for me. Sorry for the super post. I forgot about the quoted text. I replaced my networking hardware from a Linksys BEFSX41 router to a Cisco RVS4000 router coupled with a D-Link DGS-1008G switch. I also set the IPv4 networking option from Automatic (DHCP) addresses only to Automatic (DHCP) because I moved the OpenDNS DNS1 and DNS2 addresses to the router. After all this change, the 4* default applets from the upper right panel corrupt visually AFTER EACH BOOT. This is systematically reproducible, so far at least. I would like to suggest that the networking experts take a closer look at this. It may point in the direction of bug resolution. Networking updates won't affect panel applet display. Before the networking changes described in #379, visual corruption of the upper right panel applets occurred very intermittently. On this 10.04 LTS platform, I could go for many weeks, possibly months, of daily boots before hitting the bug. Now, after the networking changes, EACH AND EVERY BOOT corrupts those applets. This is systematic and reproducible. That cannot be coincidence. What is your basis for claiming: "Networking updates won't affect panel applet display"? For example, the router is now set to use DST (clock applet impact? ), before it was not. DNS1 and DNS2 have now been removed from the eth0 profile (notification area applet impact?) and moved to the router. He means that the bug is a known painting issue with gnome-panel, and that no "networking experts" should be looking into this because it is definitely unrelated to networking. Even the connections you suggest, which are valid hypotheses, are obviously only circumstantially related to networking. Most likely, network-manager is taking either longer or shorter to establish a connection than before, causing nm-applet to update at different times during session start-up, in turn triggering the race condition that causes the corruption more often. It would be equally likely that an update you installed around the same time that you switched routers made the problem worse. I use update manager once a week and did so this week prior to the networking changes. I did notice very minor panel applet corruption after the reboot. I fixed that by removing and adding back the applets manually and rebooted and "solved" the problem. The networking changes resulted in an intermittent display bug occurring reproducibly and permanently. That is a huge change in bug behaviour, but does not mean that this bug is a network bug. It just provides a clue to facilitate bug resolution. I began to experience this bug after upgrading from Maverick to Natty. When I logged into Ubuntu (Unity), I received a message stating that my hardware was unsupported, suggesting I use Ubuntu Classic instead. When I logged into Ubuntu Classic, not only were panel applets, distorted, but the windows themselves also had severe repaint/render issues, leaving the UI unusable. I believe there are other reports on this other bug, though it ought to be noted that the two might be related. 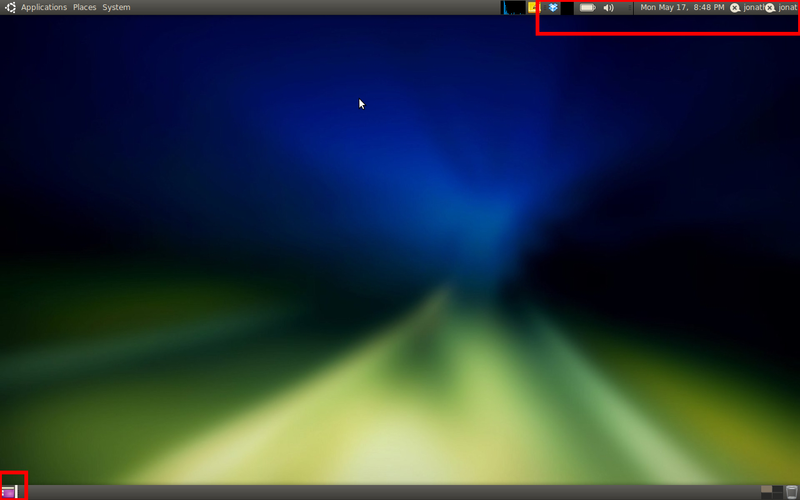 Upon switching to Ubuntu Classic (No Effects), windows appeared and repainted correctly, but the panel applet corruption remained. > I began to experience this bug after upgrading from Maverick to Natty. > hardware was unsupported, suggesting I use Ubuntu Classic instead. > repainted correctly, but the panel applet corruption remained. > ** Attachment added: "System information (HTML)"
Najam: Your issue is not the same as what is being described in this bug. You should file it as a separate bug. something similar happened to me. The problem in my case was that I had KMS disabled (in previous versions it made my graphics to work worse, so I disabled it). After enable KMS and restart computer, Unity started to work, and the distortion problem disappeared. I have just experienced new behaviour from this bug. After 5 hours of use after boot, the entire monitor screen blinked black and resized the Workspace Switcher much wider than normal. Removing from panel and adding back does NOT fix the problem. This is the first time this fix has failed. Changing panel properties orientation from bottom to right and back to bottom does NOT fix the problem. Changing panel properties to Autohide or Show hide buttons or both and closing and re-enabling does NOT fix the problem. killall gnome-panel has never worked for me, so I did not even bother to try. I will report back later whether reboot solves the problem. A reboot has successfully redrawn the Workspace Switcher. Just to follow up on comments #379, 381, 383 from 2011-04-22 where the upper right panel applets were corrupting systematically and reproducibly after each boot following a networking hardware change. I have just had my first boot where the panel applets are NOT corrupted. I estimate roughly 2 boots per day after 17 days have elapsed. I have the same issue on two machines with AMD video cards with Ubuntu 10.10. Hilarious to know this issue has existed for 2 years without fix. The only way to logout/reboot/power off when this happens is from command line. How is this user friendly? same with Nvidia 6150 and ATI 3200. It seems to affect different panel applets randomly. Doesn't happen every time. But it's a pain, because I install Mint 11 now for customers. Logout and In seems the easiest or just 'don't delete' and ignore the missing icon and carry on as usual. Not sure if it's related but I sorted the majority of my panel problems by installing the Cantarell font. Should this be a dependency for gnome 3 given it's the default font? 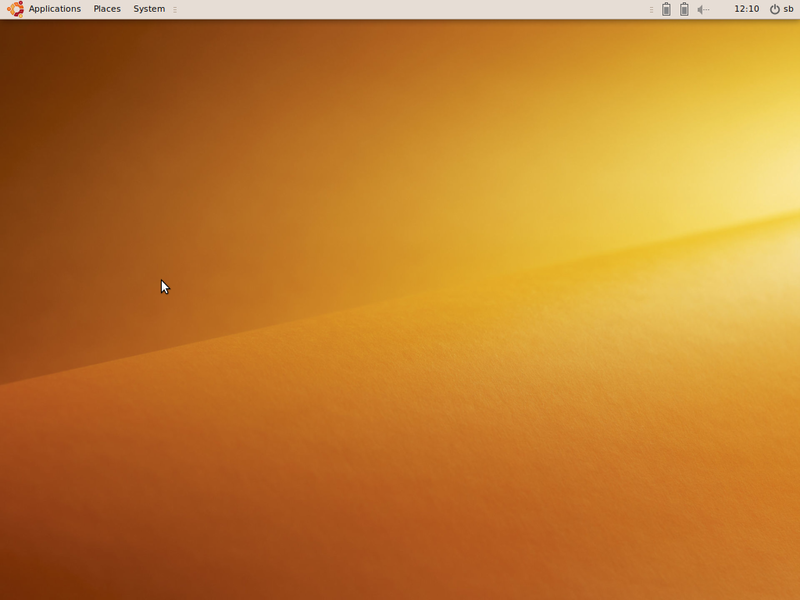 I still get some tearing and some popups are slanted but in general it has been more stable in a Gnome 3 session. Not seeing any recent activity on this in the precise release. Closing release notes task for now, since does not appear relevant to precise. Nope, this bug also affects 12.04, Precise Pangolin. :( Both gnote and truecrypt systematically show only a tiny vertical bar. Killall gnome-panel will show them on the reload but sometimes I lose other icons in the process, losing my ability to access some (still running) programs in the process. Displaying first 40 and last 40 comments. View all 399 comments or add a comment.